If you're currently using a Samsung Galaxy S II on T-Mobile's network, keep an eye out for a software update KL1 with Android 2.3.5 that will be heading your way starting today, December 14th. The update brings caller ID, battery, and Wi-Fi calling enhancements and will arrive over-the-air, although you Kies Mini may also be used for installation (starting December 15th). T-Mobile says that it is being rolled out over the coming weeks, so you may have to be patient or wait for it to be available via Kies Mini. 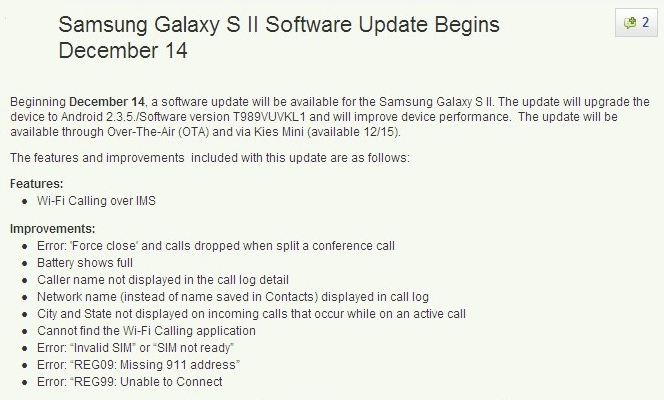 Beginning December 14, a software update will be available for the Samsung Galaxy S II. The update will upgrade the device to Android 2.3.5./Software version T989VUVKL1. Devices upgrading to Android 2.3.5./Software version T989VUVKL1 will benefit from various improvements based on customer feedback. Note: The upgrade to KL1 is NOT required. You may opt out of the upgrade and continue using the previous software version. This upgrade will be sent to devices Over the Air (OTA / FOTA) and be available via Kies mini.